Human rights activists and government officials call for reform of the prison system. Russian Prosecutor General Yury Chaika has called for a reform of the prison system, noting that the number of complaints lodged by inmates with the European Court of Human Rights is increasing year after year. Additionally, official statistics show that more than 43,000 violations in detention conditions were discovered in 2012 and nearly 4,000 people died while in custody. According to Russian daily Rossiyskaya Gazeta, the Ministry of Justice already has a draft version of a proposed prison reform. It includes a move from dorm-type housing that accommodate between 20-150 people to smaller cells that would house no more than 10 people each. Additionally, the ministry has proposed easing some restrictions on prisoners, such as allowing them to possess e-readers. 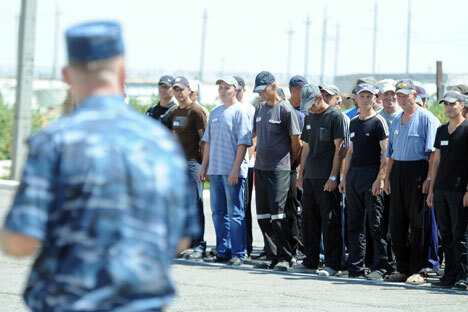 This is not the first time Russian authorities have considered prison reforms. A previous initiative was proposed in 2009. According to official data, as of the beginning of 2013, 113,500 suspects were being held at pre-trial detention centers and 588,200 convicts were serving time in correctional institutions. Pavel Chikov, head of the human rights organization Agora said that the previous reform effort focused on improving prison conditions and increasing the effectiveness of punishment in order to reduce the number of repeat offenders. “The idea was to shed the Gulag legacy and to bring prisons and colonies into line with European standards,” Chikov said. One of the most important aspects of that plan was a proposal to separate first-time offenders from repeat offenders in order to prevent the transmission of criminal culture. Another aspect involved the construction of additional prisons to further separate types of offenders. However, experts calculated that the program as envisioned would require a whopping 1.8 trillion rubles ($600 billion) – an amount that was never appropriated in the federal budget. Vladimir Osechkin, founder of the Gulagu.net social network, believes that re-launching the reform in the right direction would be possible under third-party civil and public supervision of the federal prison authority (FSIN). “The authorities understand that the FSIN cannot police itself; therefore, third-party civil and public supervision is essential,” Osechkin said. He particularly recommended that the role of the Public Monitoring Committee (ONK), whose members make sure that the human rights of prisoners are being observed, should be considerably expanded. Specifically, he would like to see ONK members have the right to enter any penitentiary institution without seeking an approval from the governor. Additionally, he would like to see the replacement of the current network of 700 observers by 3,000 independent human rights activists, volunteers and civil activists.